It is time for you to ponder about the air conditioner system more seriously as the hot weather is fast approaching. It is crucial that one to need to check for aircon coolant or Freon, commonly known as air con gas, level at least once a year. Air-conditioning specialists state that just ten percentage loss in Freon level, may result in the electricity cost to be shoot up by more than twenty percentage. It can also result in undesirable tear and wear which further increase the maintenance expenses. Reduction in Freon or refrigerant levels may be due to two reasons: unable to retain charge or due to leak, which both have to be repaired by technicians. Issues like Freon leak can shoot up overtime and you need to entrust an efficient professional to work on it. Refrigerant or coolant is the gas that helps to transfer heat in the air conditioner. When air con gas level is low, it can result in reduced cooling, freezing of coil and decreased efficiency. Air conditioning system has to be recharged or topped up with aircon gases like R22 or R410. Coolant R22 is a colorless, non-poisonous, flammable and translucent liquid at room temperature. R22 is known to have exceptional thermal and chemical strengths. In air conditioner R22 is used whereas R410 is used in inverter air conditioner. Under no circumstances, these two aircon gases be mixed. However, R22 is currently discontinued across the globe as it causes ozone depletion. 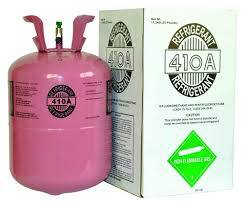 Refrigerant R-410A is chlorine-free and much-admired in the industry. They also demonstrate greater consistency, noiseless mode of operation, enhanced dehumidification and improved overall performance. They function at higher pressure levels as compared to R-22 and should be designed of elements which can work efficiently at such pressure levels. It is a good solution for residential and commercial purposes. R-407C is a also an efficient aircon gas. Like R-410, R-407 C also does not result in ozone depletion. Functional aspects of R-22 is somewhat similar to R-407 C. Pressure levels for operation is somewhat similar to that of R-22. However, efficiency is somewhat lower compared to R-410. This coolant also finds its place in many large commercial AC and refrigeration systems. It is an environment-friendly coolant and does not result in ozone layer depletion. 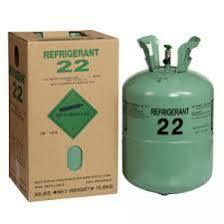 At normal temperature, HCFC-22 is a colorless aircon gas and is non-poisonous and translucent liquid at the same time. It has remarkable thermal and chemical properties and does not result in corrosion. Our Aircon Service Company with the support of well qualified and skillful engineers, who continuously endeavor to offer the best aircon servicing to our treasured clients. If you felt that your aircon is working fine but not cooling, you might want to check and top up your aircon gas. Get in contact with us for a quick air con recharge today.